Iran has one of the richest art heritages in the world and is home to a number of art traditions and skills. Iran has been in the limelight for various reasons, some of them being nuclear deal conflicts and cultural invasions. 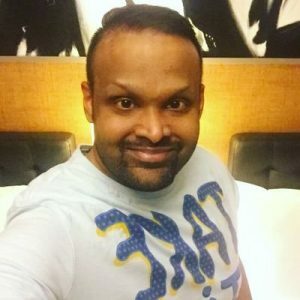 The advent of internet and technology has allowed the world to communicate and discover unseen and untold faces of other countries. Apart from the globalization and traditional factors that affect Iran, there are other contradictory factors that make Iran a beautiful country. Iran has one of the richest art heritages in the world and is home to a number of art traditions and skills including painting, pottery, calligraphy, architecture, weaving, metalworking and sculpture. Iranian art, or Persian art, behold the most unique and oldest techniques in each art discipline which makes it one of the most sought after artistic countries. Iranian miniature paintings, ceramics, sculptures, book art and metal work are in huge demand worldwide due to the intricate detailing and innovative techniques used to create the artwork. Iran has a rich heritage and art history and there are six key milestones which make the legacy of Iranian art really powerful. Syria, Turkey, Iran, and Iraq, which were called with different names at that time, saw a major part of the Uruk period. Along with mesmerizing architecture and artistic mosaics, the Uruk period saw a growth in pottery making and proto- writing. An important colony of the Uruk period, Susa had the most influential protowriting skills along with pottery and cylinder seals. The skills and details of the artists are praiseworthy because the tiny errors or asymmetry in the creations show that all were handmade. What makes it incredible is at a time where neither machinery nor technology exists, the magnitude of artistry and talent was superior. Another interesting factor that played an important role in the Uruk period was keeping the records of goods and workers through pictographs. Although they were intended for management purpose, the pictographs are an example of exquisite artwork. 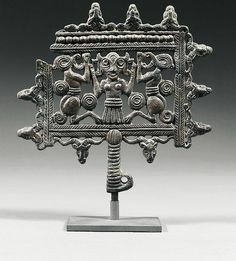 The Early Iron Age took place around 900 – 600 BC period and this era saw the advent of metal artistry. The most common metal used to carve out intricate and detailed sculptures was bronze. The sculptures made out of bronze were called Luristan Bronzes and they were found in many locations in west- central Iran by archaeologists. The use of metal at a large scale was sculpted into a number of art pieces including weapons, tools, horse- fittings, vessels, and ornaments. The tools used to carve and hammer the pieces were quite simple but the techniques were innovative. Intricate carvings over the metallic artwork were manual and time-consuming. 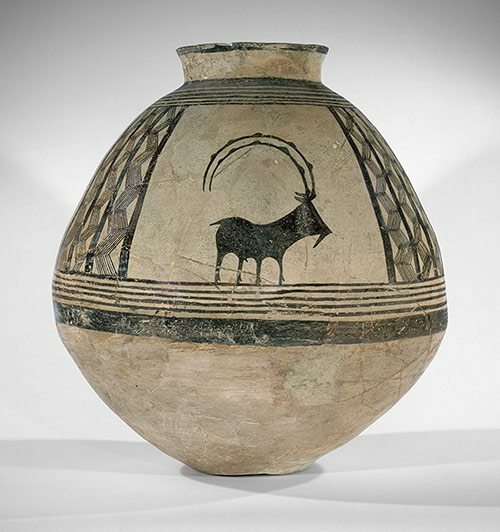 This era saw the formation of representing animals, most common of them being goats or sheep with large horns in a number of different forms and styles. This era emerged during the 9th and 10th centuries. The Sasanian Empire ruled in 651 which came to an end after the “Muslim conquest of Persia”, or the “Arab conquest”. It also led to the decline of the Zoroastrian religion in Iran. After this era came to an end, artists in the region showed exponential growth and potential, which visualized the 9th century as the golden period. Locations such as Greater Iran and eastern parts saw the increasing importance of the Turkish people and this led to a cultural Turko- Persian tradition. Iran saw the advent of two important dynasties which were the Samanid dynasty and the Seljuq dynasty, both of which enhanced the importance of Persian art during their time. Pottery, ceramics, metal work and book painting especially rose in demand. During the Samanid dynasty, a Sunni empire ruled over many parts including Afghanistan, Iran, Turkmenistan, Uzbekistan, Tajikistan, Kazakhstan, and Pakistan. 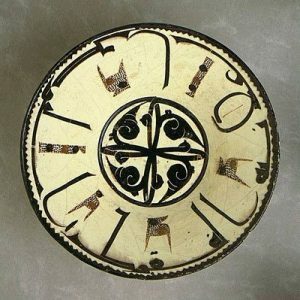 This era specialized in epigraphic pottery which was an earthenware vessel with lettering involving proverbs and blessings inscribed on it, which was used to serve food. The lettering was in Kufi script with black slip on the white base. The Seljuq dynasty which ruled during the 10th century was responsible for bewildering innovations in materials and techniques. 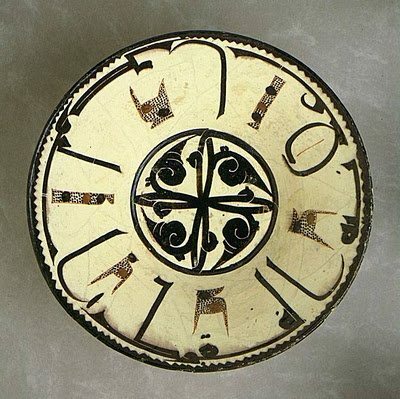 Materials such as minai ware used on a white background along with enameled figures, fritware and a silicon-based paste were introduced and hence they replaced clay. The discipline of metal work and sculpting during Islamic Art period also took to new innovations. Along with the hammering of the metal to create detailed designs, artists during Iranian art period also added precious metal inlays to highlight the art piece. Book paintings also shot to fame from Iran to Iraq which contained animalistic figures to portray fidelity, treachery, and courage. Book paintings also led to the widespread of Persian calligraphy which became one of the most sought after disciplines. This era formed many dynasties throughout the 13th century due to the division of the Empire among the sons of Genghis Khan. 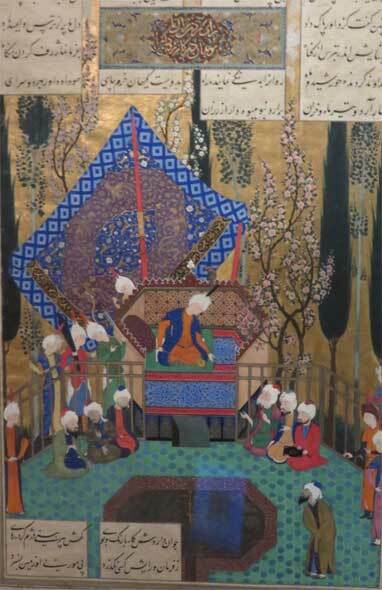 Each and every dynasty contributed towards art and helped it grow which led to the Golden Age of Persian painting. The main disciplines which were widespread at Persian art time were calligraphy, illustration, and paintings which represented the culture of Mongols. However, there were criticisms against the rulers of displaying the Persians as Mongols at that time. This era also contributed a lot to the development and spreading of a number of art disciplines such as weaving, miniature paintings, and ceramic artistry. Persian carpets and rugs were in huge demand due to the representation of the tribe’s culture and excellent artisanship. That is when the art of weaving got a boost. 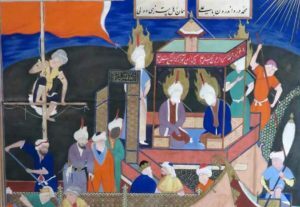 Book illustrations and Persian miniature paintings were practiced thoroughly and they often displayed narration and thinking skills. The artists also used a lot of human figures to narrate their stories. Even though Persian art never sought to completely forbid the human figure, miniature paintings contained them as the central plot due to its privacy. New types of vessels and ceramic objects were practiced such as goblets, long- necked bottle, and plates. The new shape of the vessel which was invented was a flask shaped vessel with a very small neck and flattened body on one side and rounded body on the other. 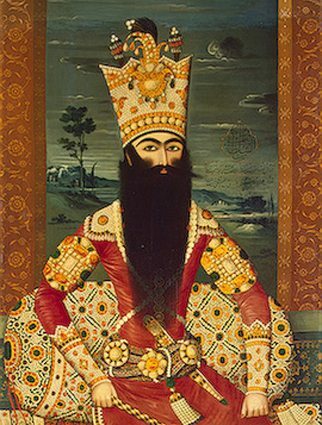 The Qajar dynasty which ruled from 1781 to 1925 had a great impact on the empire’s art, architecture and art forms. Paintings and large murals were an integral part of the Qajar art. The period of relative peace along with the rule of Agha Muhammad Khan and his descendants gave a major burst to the artistic expression. The paintings and murals portrayed historical scenes and revelry, which was specifically created to be put up in palaces and coffee houses. Special arched tops on the paintings were attached to fit them into walls. 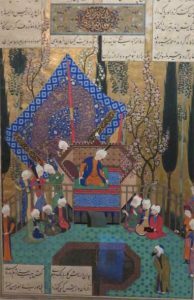 The style and portrayal of paintings create an assumption of the Qajar dynasty having its roots attached with the Safavid Empire. The portrayal of inanimate objects and human beings were depicted opposite to their nature. While human beings were decidedly idealized and placed with standardized features, inanimate objects were shown as real objects. This was corrected by the rising discipline of photography in the 19th century. All the disciplines and their sincere follow-ups make Iran a rich and vibrant land with the most interesting tradition and culture. Not only traditional art, but modern Iranian art is also rising and forming a platform for itself, which is equally praiseworthy. Iranian art or Persian art has evolved and changed faces in all disciplines due to a huge number of dynasties. The elegant style of artistic skills, for example, weaving has left a great impact on the world with their finished and teaching skills. Persian Art is effectively contributing to the world with its oldest and innovative techniques, which is forming a huge demand in today’s world and has also remains as a reference point for its artistry and awesomeness! Originally published by The Artist under the terms of a Creative Commons Attribution-NonCommercial 4.0 International license. This entry was posted in Art History, History, Persia. Bookmark the permalink.